Globalization has had a profound effect on North-South relations buthas affected different regions and countries to different degrees. The extent of globalization has also been exaggerated. Only a few countries, largely in Southeast Asia, have enjoyed rapid growth based on the export of manufactures. International flows of private capital have been concentrated on a handful of countries. Poorer countries have relied heavily on official borrowing and foreign aid. Debt problems have led to widespread imposition of structural adjustment programs, with ambiguous results. The collapse of the Soviet Union and its satellites. Finally, the book also examines a number of approaches to development that do not rely on growth — many of which originate in the South — and assesses their likely impact on North-South relations. Interdépendance, déséquilibre et croissance will appeal to academics, students, and researchers in development studies, international relations, economics, political sciences, and sustainable development studies. It will also appeal to development professionals and informed "internationalists" worldwide. 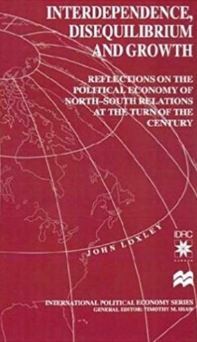 John Loxley is Professor and former Head of the Department of Economics at the University of Manitoba in Winnipeg. His distinguished career includes stints at Makerere University and the University of Dares Salaam in Tanzania, as well as serving the governments of Tanzania, Uganda, Madagascar, Mozambique, and Manitoba as an economic advisor. Professor Loxley is the author of Debt and Disorder: External Financing for Development and the coordinator of the Alternative Federal Budget exercise in Canada.